Carpet tiles are squares of carpeting that connect together to form a modular carpet. The ability to combine different colors, textures and patterns within one rug lets you create a custom rug made just for your home, often without custom pricing or installation costs. Carpet tiles come in an incredibly wide variety of different thicknesses, adhesive types, colors and patterns. They can be installed nearly anywhere in the home and have several advantages over standard carpets. Depending on where you are placing them, and what you are using them for, you may want to consider one of these types of carpet tile. 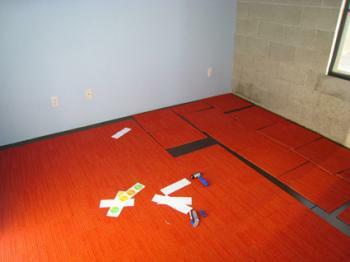 Some carpet tiles can be installed directly to the subfloor. These tiles are meant to be used as a total floor covering, like wall-to-wall carpet. They can be used on the stairs, or anywhere regular carpeting is installed. They come in different thicknesses and wear ratings and are suitable for high-traffic areas in the home. Carpet tiles can also be used in the place of throw rugs. Because you may not want your throw rug adhered directly to the floor below it, there are carpet tiles that adhere to each other, rather than to the floor below. These tiles fit snugly together to form a large throw or area rug. The entire piece can then be moved around, or disconnected and put back together again. This system works well for covering other floorings, like hardwood or tile that you wouldn't want a permanent rug installed over. 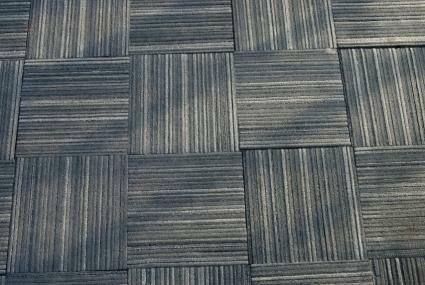 Tile to tile connection style carpet tiles also come in a variety of thicknesses and wear ratings, which makes them ideal for entryways and children's playrooms. Once you've determined the type of carpet tiles you'll be installing, and the location for them, your next step is to determine what type of adhesive you'll require. To help make your decision, ask yourself the following questions. How Thick Is the Carpeting? Thick, plush carpet tiles will need a heavier adhesive to hold them in place securely. If you are using any kind of underlayment or padding beneath the tiles, you'll want a more heavy duty adhesive as well. Will You Be Removing Squares? If the carpet tiles are going in an area where you'll be occasionally replacing individual tiles as time goes by, make sure the adhesive is releasable. Releasable adhesives will let go with a little moisture or water, allowing you to pull up a tile and replace it with ease. Is the Floor Subject to Moisture? While releasable carpet tile adhesive is a plus for changing out tiles, it can be a nightmare in damp basements or bathrooms. Even a small amount of moisture seeping up through a concrete pad can ruin your carpet job, so use a moisture barrier adhesive instead. Are the Tiles Going on Stairs? Carpet tiles are a great covering for stairs as well as floors. Stairs do get a specific type of foot traffic and placement, which requires a heavy duty adhesive to hold them in place. No matter which type of carpet tile you are using, installation is fast, easy and something any homeowner can do themselves. If your carpet tiles need adhesive, you may find they install similarly to other soft floor tile, such as vinyl or linoleum. Clean and damp mop the floor where the carpet tiles will be installed. Remove any dirt and debris and allow the floor to dry completely. Dry layout your carpet tiles onto the floor to make sure they fit and finalize the pattern you are using. When you order your tiles, take the rooms dimensions into account; many tiles can be made to fit the room exactly when put together. Pull up a few of the tiles and trowel on the adhesive. Because adhesives can vary tremendously, refer to the adhesive manufacturer's instructions for thickness and drying times. Use a paint roller to apply the adhesive to the backs of the tiles, not to the floor. Ensure good, even coverage over the back of the entire tile for best adhesion. Lay the tiles adhesive side up until the adhesive has dried to a clear, non tacky finish. Turn the tiles over and place them on the floor in the pattern you desire. Set the tiles back into place and snug them together. Roll the tiles with a 100 pound floor roller to bond the adhesive to the subfloor. Every floor tile company has its own method for installing tiles to one another, rather than to the floor. Specific instructions will accompany the tiles you are using. Dry layout the tiles to determine their pattern on the floor. Take up two to four tiles at a time and press the connectors onto the corners of the tiles. Lay the tiles back into position, and snug up the next tiles onto the connectors from below. What Is Self-Adhesive Carpet Tile? The glueless system means that you can install the tiles yourself, saving both time and money, and that you can lay them over your existing wood, cement, linoleum or vinyl floors. However, you must ensure that your surface is well cleaned and dry before installing the tile. High quality carpet tiles can be cut to fit with a utility knife, so you can shape the tiles to fit an entire room if you want. The price range for self adhesive carpet tile is about 60 cents per square foot for cheap factory seconds to 16 dollars per square foot for designer versions. Measure the space to be carpeted. As a general rule of thumb, buy 15 percent more carpet than you think you will need for the space so you are prepared in case there are any problems during installation. Clear all the furniture from the space and clean the floor thoroughly. Any dirt on the floor will interfere with the adhesive strip. Locate the center point of the room and divide the room into four quadrants. Put carpet tiles down quadrant by quadrant. 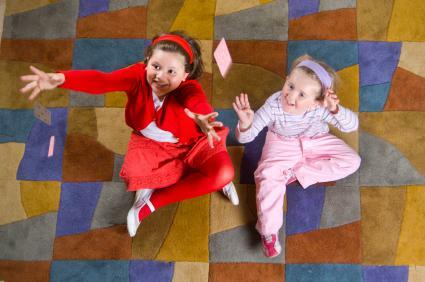 Take one carpet tile, peel the paper off the back and press it down on the floor. The way you lay the tiles will depend on the design you are trying to create. If you need help keeping the tiles straight, use a straight edge or ruler. Repeat until all the carpet tiles are laid. You will likely have to cut the tiles closest to the wall off to make them fit. Don't allow manufacturer's edges to touch. Your carpet is ready to be walked on as soon as you have finished laying it. During the last few years FLOR has completely redefined the modular carpet market. The company was launched in the spring of 2003 with the idea that carpet tiles could be fun, stylish, practical, and environmentally responsible. FLOR is a design system of 19.7-inch squares that come in a wide range of gorgeous colors, styles, textures and patterns. All of their products are designed to coordinate so homeowners can mix and match styles and create custom designs to fit their spaces. On their website, or at FLOR dealers, you can either design your own or let one of their experts help you create a unique vision. Installation is a cinch with the company's non-toxic FLORdots, which connect the tiles to one another and not to your floor. Because of this unique design, there is no damage to your floors underneath. With an aim towards environmental responsibility, each FLOR tile is made with renewable and recycled content. The company will even recycle your tiles if you return them once they are no longer usable. Berber peel and stick carpet tiles are incredibly economical and durable. The 12-inch by 12-inch squares are woven from stain-, fade-, and stati-resistant Olefin fiber that doesn't require any underlay or padding. These particular tiles can be cut to shape or size with a utility knife, and will not come unraveled. This feature allows you to create endless custom looks, such as a different-colored border around your room. They can also be installed outdoors with a specific outdoor adhesive. One set of 20 carpet tiles will cover 20 square feet and a set of 80 tiles is enough for an 8-foot by 10-foot room. Carpet tiles clean up exactly like typical area rugs or wall-to-wall carpeting; vacuum or spot clean as needed. The true benefit of carpet tiles is the ability to replace a tile if it becomes too soiled or damaged. If your tiles are glued to the subfloor, soak them in water to dissolve the adhesive, remove and replace. If they are connected to one another, just peel them off their connectors and replace as needed. Like any floor covering, carpet tiles have their advantages and disadvantages. Carpet tiles have a few advantages over other carpeting. 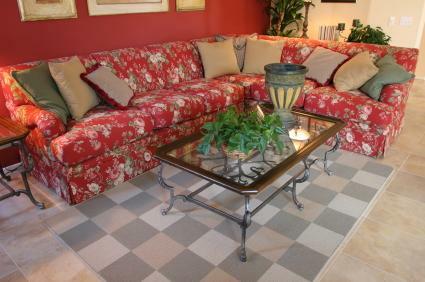 They can be arranged to make a custom design for less than the cost of a custom carpet. They can be changed out and replaced easily in case of damage. They are easy to install for a DIY homeowner. They are equally easy to remove. No flooring is perfect, and carpet tiles are no exception. Carpet tiles can be pricey. They start around five dollars a square foot, but can go as high as 80 dollars a foot for some of the more luxury naps. Padding can be problematic with the squares, which may make them less dense underfoot than traditional carpeting. This can also make them less effective at soundproofing a room. Carpet tiles aren't as widely sold as traditional carpeting and area rugs. In many cases, the best scenario is to go straight to the manufacturer. Flor: Flor makes a wide array of carpet tiles in a variety of patterns, colors and thicknesses. Their tiles connect to one another, rather than to the subfloor. Interface: Interface makes carpet tiles that connect to one another as well. They have several patterns to choose from. Mannington: Mannington has multiple designs for modular systems that adhere to the subfloor. With the many ways that carpet tiles can be pieced together to form a custom design, you'll have no trouble finding one that works with your home. For your stairs, your entry way or your living room, carpet tiles deliver what traditional carpets cannot.